During our time in Kanchanaburi Shirley and I visited the Tiger Temple. This is one of those events that seems like it is going to be too much of a tourist thing but is actually a once in a life time experience. Disclaimer none of the pictures on this page were taken by Michel. All of them come from my Ipad. We arranged for a songthaew to take us to the Tiger Temple from the River Khwae (Kwai). 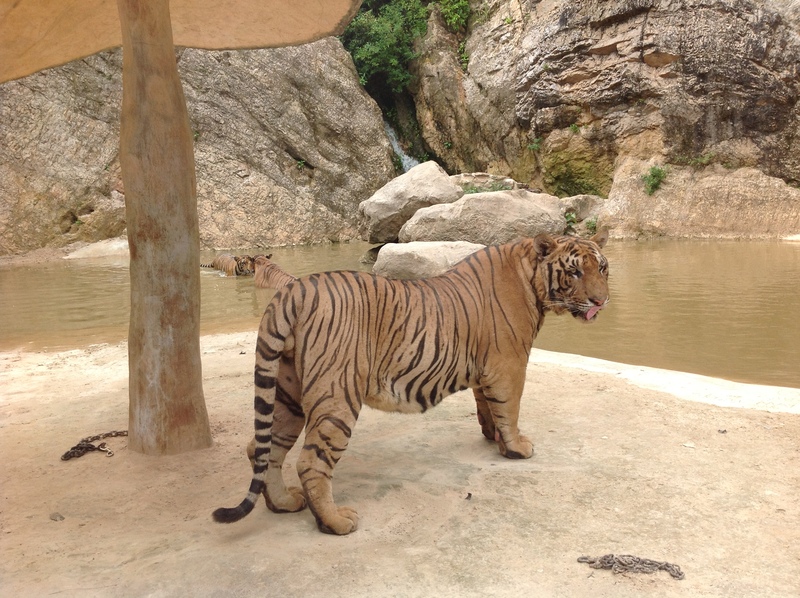 I knew that tiger temple had something to do with monks and tigers but that was about it. If I had actually researched it before going I might not have gone as there is so much questionable press out there about it. Fortunately I did not research and was able to find out the truth by making a new friend at the temple. 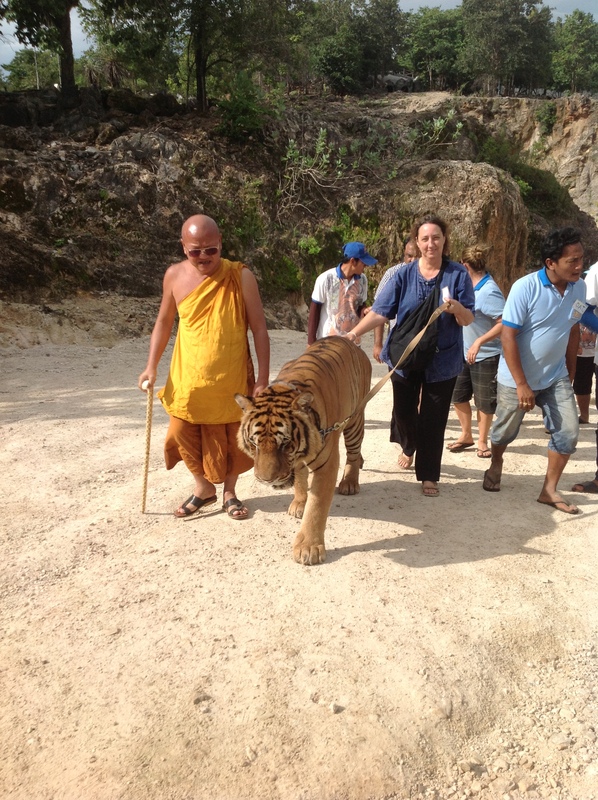 Years ago the locals brought an injured baby tiger to the monks at the temple. Over time many more tigers were brought. This was the beginning of what is now the Tiger Temple. It seems that over the years the temple has been taken over by professional animal handlers and voluteers. There is a contingent of local handlers as well and I assume they have been trained by the Ex-pat handlers that I met. Monks are still involved but there are only 3 of them left who handle the tigers. In particular, I had a long conversation with a gentleman from Canada who had been working with the tigers for (if memory is correct) 4 years. During my conversation with him I noted that he was a little bit defensive about some comments animal activitists were making that implied the tigers at the temple are drugged. He emphatically denied that any of cats are drugged and I believe him. 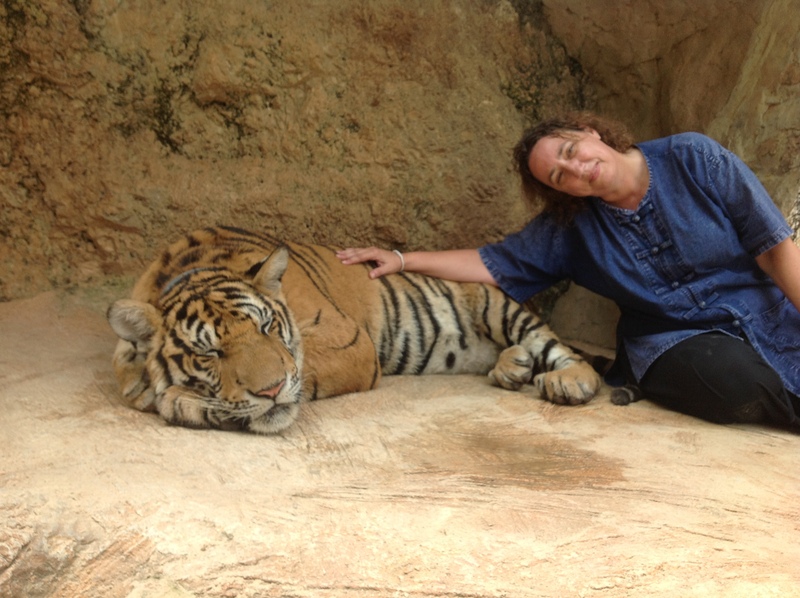 The Tigers that I met were happy and sleeping in the hot humid air. Very similar to my own sleepy domestic cat back in florida who literaly sleeps 18 hours a day. 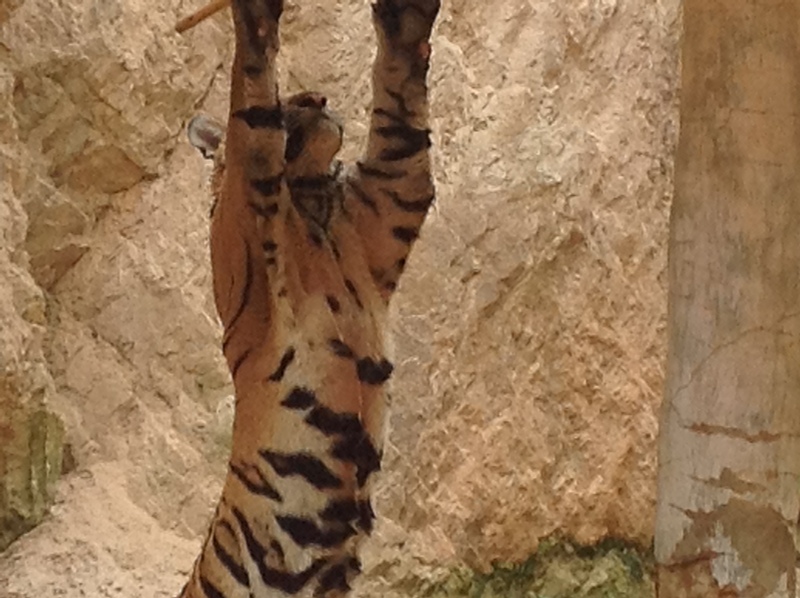 I also observed that when excersize time came all of the big cats were alert and ready to play. They could never have been so if drugged. My canadian expat friend also informed me that the tigers are being used to educate the locals regarding tigers. There are aparently 2 subspecies that are already extinct. The Chinese believe that tiger parts have medicinal qualities and this may be constributing to the poaching of tigers that occurs in Asia. All in all, my observation is that the tigers are well cared for and loved. There was more than one staff assigned to each person who touched a tiger. The guest was always instructed on how to touch the cat and how to move. Guests are not allowed to wear shorts or short pants. They are also not allowed to wear bright colors. The number of people around the tigers at any time appears to be controlled. A small group of us (costs extra) were allowed to stay behind after the park closed and watch the tigers being excersized. How do you excersize a tiger? Same way as my cat back home; bring out a brightly colored toy that makes noise and wave it around. 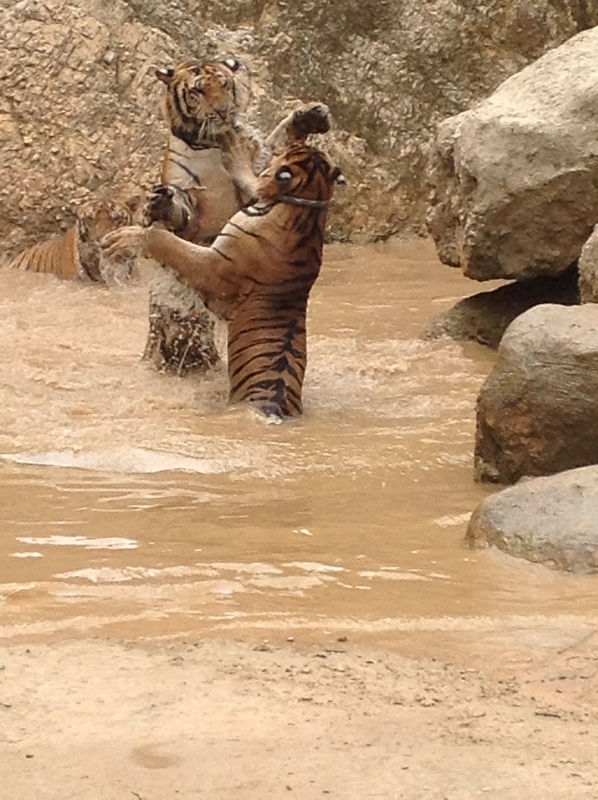 These big cats like to play in water and if I could I would have joined them as the temps were in the 90s. The small group of people who were allowed to stay for Tiger excersize stand behind a metal barrier that would in no way stop a tiger. My Canadian friend informed me the barrier used to be a rope but the humans were too nervous so now it is metal. I was always aware of how big and heavy the tigers were while around them. Never any doubt in my mind that if I was accidently mistaken for a toy it would not be fun but the handlers did a good job of keeping the tigers on their side of the line. It was an amazing exhilerating experience that I will never forget! Watch this video created the day we visited the temple. Amazing! Truly a once in a lifetime experience. I just want to play with the kitties and it would probably be the last thing I was alive to do but oh my they are so amazing. 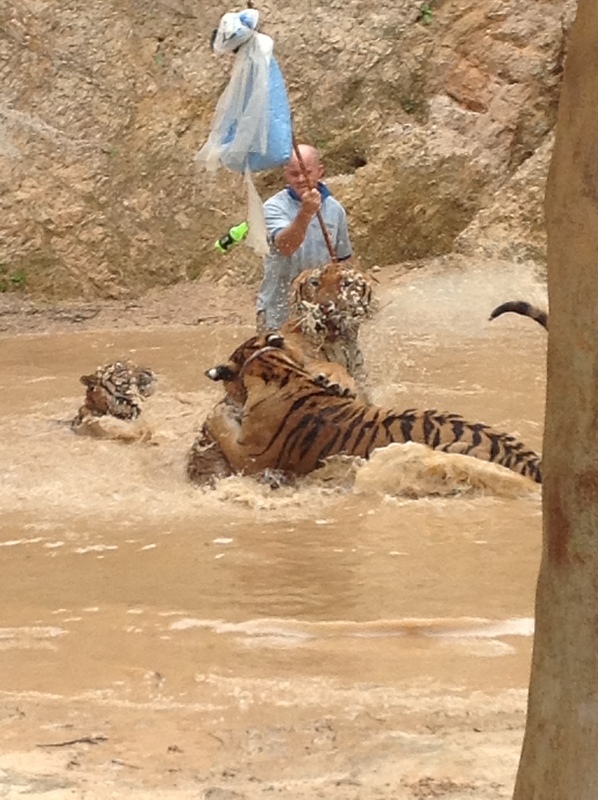 Glad they are protected and people can experience this and be educated about Tigers. When I think about the love and ferocious playfulness of my little tigers at home, I can imagine the personalities of these big cats though they have 1000 times the destructive power at least. I get scratched and bitten when I truly play with my little cats. I can just imagine the big cats doing damage without even meaning to. Just amazing you could be so close and get to touch them and interact with them! Love you and happy travels! Wow, thank you so much for sharing your adventures! I especially love the photo of Claire walking the tiger. What an amazing adventure you are having, and such wonderful photographs!